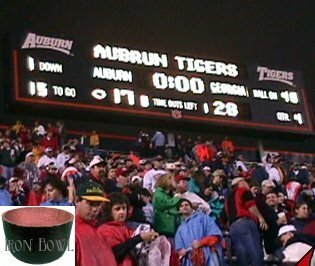 Opelika() A recent examination of resumes on file at the Southern Company reveals that 31% of Auburn University graduates actually spell the school name 'Aubrun.' In addition, another 8% spell it 'Aubun.' Several other spellings were found including 'Alabama Polytechnic,' but none as common as 'Aubrun.' When asked for comment, Aubrun University officials replied that although 'Auburn' is certainly the preferred spelling, 'Aubrun' is so common that it has become generally accepted. "Just because someone spells it 'Aubrun' is no reason not to look at their resume," said Southern Company Human Resources Associate Nancy Bernard. "I mean if I rejected every resume that came across my desk just because of some spelling error, I wouldn't have many employees." An informal 'Hamster survey of Auburn fans in Birmingham reveals that although only 31% misspell the name, over 53% mispronounce it as 'Awe-Barn.' In addition over 75% of the self identified Auburn fans did not in fact attend the university. "We don't usually have that problem," said Bernard. "Most of the candidates that list Auburn on their resume did in fact attend the university, if sometimes only for a few weeks." According to the 'Hamster Applied Mathematics Department, if every Auburn fan had in fact attended the school, there would be over 2.5 billion alumni. In addition to these surprising figures, over 82% of fans surveyed were unable to locate Auburn on a state map. And only 5% recognized that they were looking at a map of Georgia. 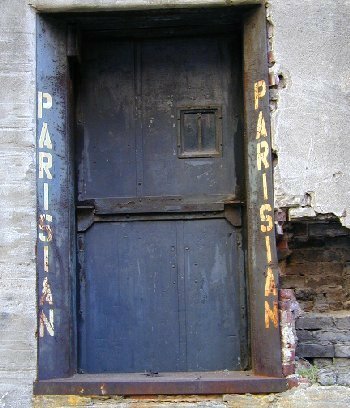 Peshawar() Officials from Birmingham based Saks Incorporated have announced that the Parisian store in Peshawar, Pakistan, which has struggled to remain profitable despite decades of violent skirmishes in the region, will close its steel-reinforced doors for good on Friday. Local representatives of General Pervez Musharraf's hard-line military regime have expressed regret that yet another link in Pakistan's global network of commerce has been severed, while local leaders praised the withdrawal of the 'Great Satan of Zionist Capitalism' from Peshawar's once proud boutique district. Former manager Muzaffar Khan Massoud said that profits were pretty much wiped out when local fundamentalist Imams called for the faithful to fire-bomb the window displays of this year's Hilfiger fall collection, apparently finding the semi-clothed female mannequins too much for the eyes of Allah's weaker sons. "We tried to make the display as tasteful as possible," said Massoud. "But Hilfiger just doesn't make a full-face niqaab." During its last week, the Peshawar Parisian will hold a special Bargain Days event, with savings as much as 50%. However, the additional 10% savings for new credit card customers will not be available. Saks Incorporated operates 62 Saks Fifth Avenue stores, 40 Parisian specialty department stores, and 203 other traditional department stores under names like Proffitt's, and McRae's. Hoover() In conjunction with the opening of its new Hoover location, Krispy Kreme is launching a pilot program which will notify area residents when a fresh batch of hot, wet, gooey confections slides onto the rollers at any one of three Birmingham locations. The new service extends the reach of the 'hot doughnuts now' sign directly into cyberspace. Customers who subscribe to the free service can elect to receive a page, voice message, or personalized email on any number of wireless devices. The service is intended to move more hot doughnuts out the door before they become the cold Krispy Kremes that no one wants. "We throw away a tremendous number of edible doughnuts," said Krispy Kreme associate Darren Thompson. "Once they pass that eight hour mark, no one wants them. I can't say I blame them either. The glaze gets all runny and the doughnut gets soggy." With the Doughnut Paging System (DPS), Krispy Kreme hopes to increase the volume of hot doughnuts sold by 80% over the next two years. Local police digital radio systems have been tied to the DPS for the past six months with great success. "We always know when there are fresh doughnuts in East Lake," said Birmingham Police Chief Mike Coppage. "One time two of our men got dispatched to the Wavaho station to check some suspicious activity when the doughnut call came through. Of course the officers first made a routine check before proceeding to get some doughnuts." Businesses around Krispy Kreme locations are equally happy to hear about the new system. "I can't tell you how many calls we get everyday asking if the 'hot doughnut' sign is on," said Mike Jeffers of East Lake Auto Sales. 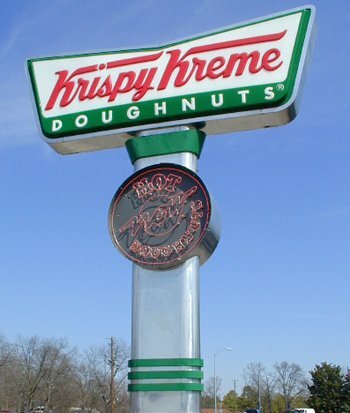 If the system proves successful, Krispy Kreme plans to roll it out nationwide by the end of 2002.